The Aspen Institute Romania, Adevarul Holding and Link Resource are organizing a high level symposium on policies and best practices in healthcare regulatory issues – “Bucharest Forum / Healthcare. A Path to Sustainable and Inclusive Medical Care” on February 15, 2013. Confirmed speakers include Dr. Panos Kanavos, Reader in International Health Policy in the Department of Social Policy, London School of Economics (LSE) and Programme Director of the Medical Technology Research Group (MTRG) at LSE Health London School of Economics, François Martelet, Board Member European Biopharmaceutical Enterprises (EBE), EFPIA, Hans Christian Hoeck, CEO, Center for Clinical and Basic Research (CCBR A/S), Markus Glimm, CEO, TRX Care, Ana Maria Mihaescu, IFC Chief of Mission, Moldova & Romania, Alexandra Carides, Ph.D, Assistant Professor, Statistics Department, Fox School of Business, Temple University, Richard Florescu, Human Development Specialist, World Bank or Bogdan Chiritoiu, President, Competition Council. Building on a network of European and American expertise in areas encompassing medical technologies and R&D, financing, zoning and prioritizing, but also communication, the organizers aim for a lively, non-partisan and inclusive debate. This event will gather healthcare sector specialists, national and European regulatory experts, medical technology and pharmaceutical sector researchers and decision makers, as well as healthcare sector business leaders, with significant role in shaping public and private healthcare policies. The debate is part of the Aspen Institute Romania Regional Healthcare Reform Program, a policy program launched in 2011 with the aim of developing a credible and functional platform for healthcare reform dialogue and problem solving and creating a relation of trust and mutual benefit among stakeholders, both public and private. This project is also rooted in the highly esteemed work of the Aspen Healthcare Reform Programs in the US and its Aspen Health Forum. One of its aims was to create the basis for an inclusive Romanian conversation for the sector\’s various professionals and decision makers at local and national level. Working together with all stakeholders, the Aspen Institute Romania has hosted a roundtable and ran several working groups, representing medical care and services providers (public and private), manufacturers and product providers, patient associations and representations, NGO\’s representing the medical sector, federations, unions etc. ; paying institutions: CNAS, Ministry of Health, local authorities, line ministries operating healthcare providers, private insurers; policy integrators: parliamentary health committees, regulatory authorities, advisory groups, private sector consultancies. Following a series of meetings of these working groups and an extensive effort to integrate competing and sometimes diverging perspectives, a report has been compiled and forwarded to relevant authorities. The Aspen Report focused on concrete policy recommendations in identified priority areas, and representing the positions and perspectives of all stakeholders. The Symposium came about at the intersection between Aspen Romania\’s previous work and Adevarul Holding\’s initiative „What should we do with Romania?” – an awareness campaign at national scale that focuses on critical societal issues. The initiative\’s rationale is that after joining NATO and the European Union, Romanian politicians and members of the civil society do not appear to have a common goal regarding the future of the country. In the absence of this common objective, towards which all responsible actors should work together, every public policy is heading towards failure. The healthcare reform makes no exception. The need for a common narrative to inspire and incentive inclusive and non-partisan approaches is even more imperative after last political summer. Bucharest Forum / Healthcare is part of this large initiative aiming to coagulate all the factors involved in creating health policies. The symposium is divided into four panels: 1. Financing the healthcare system; 2. Research and development in the healthcare system; 3. Responsible healthcare sector communication; 4. Health technology assessment and innovation. The panel will explore the options available for the Romanian healthcare sector public and private decision makers in the framework of constraints raised by the overall context of austerity and low GDP growth rates, but also by the need for Romania to adopt longer term policy and financing framework. With the representatives of the Ministry of Finance, relevant EU and national agencies and relevant IFO active in Romania, but also with the contribution of large scale investors in the healthcare field, the panel will attempt a clarification of the perspectives for areas like optimal tax and claw back policies; investment in the healthcare sector; equality of treatment of public and private providers; EU financing framework for healthcare etc. 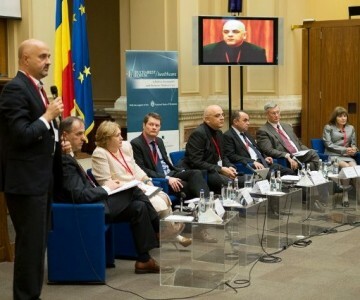 European norms and regulation regarding healthcare research will impact the development of a lucrative and highly competitive sector; given the rapid shift in business models and therapeutic solutions, the set of healthcare policies needs to take into consideration the impact of R&D costs and processes; the experience of national systems that already adopted sweeping changes in their regulatory and national policy frameworks is relevant to Romania. The need for convergent European norms and regulations is increasingly shaping this sector; communication implications are highly relevant for healthcare providing companies, as well as for the media, regulatory public agencies and the general public or the consumers. Achieving a competitive, transparent and effective communication framework for products and services in the healthcare, public health and food safety areas is a major factor for the overall standing of the sector; investment and business decisions may be shaped by the policy choices in this domain. Public procurement frameworks, regulatory provisions for financing investment in healthcare technology will be covered in the panel discussion. As medical needs change and pressure on funding increase, new appraisal models emerge and become more frequently employed for determining the reasonable consideration to be paid / cashed-in. Under the scope of these new appraisal models, commonly known as Health Technology Assessments (HTA) fall medicines, medical devices and / or medical services. HTA may be employed by both public and private payers in establishing a new paradigm for product deployment where this process is perceived as costly, and hence HTA is likely to induce a shift in (public) procurement process. Also covered will be technology and cost implications of policy choices, and the other way around, technology and innovation mediated solutions for policy challenges in the Romanian healthcare sector. EU competition regulations, as well as financing, market access and procurement regulations apply. Completing the circle, this will allow an integration of practical questions in the larger, macro financing issues discussed in the first panel of the symposium.